I know some people are scared by the fattiness of pork belly, but I can’t resist it. I’ve been cooking pork belly for years and recently figured out a recipe that is perfect for three different dishes: buta kakuni, ramen, and the increasingly popular Vietnamese sandwich – bánh mì. As with all braised meat, cooling the pork belly in its braising liquid keeps the meat succulent. Refrigerating it makes removing the excess fat simple and slicing the belly a breeze. I like to use tsuyu (Japanese noodle dipping sauce) to jump-start my braising liquid, but you can also use a rich dashi stock instead. The pork will be lighter in color and flavor, but still unctuous and delicious. 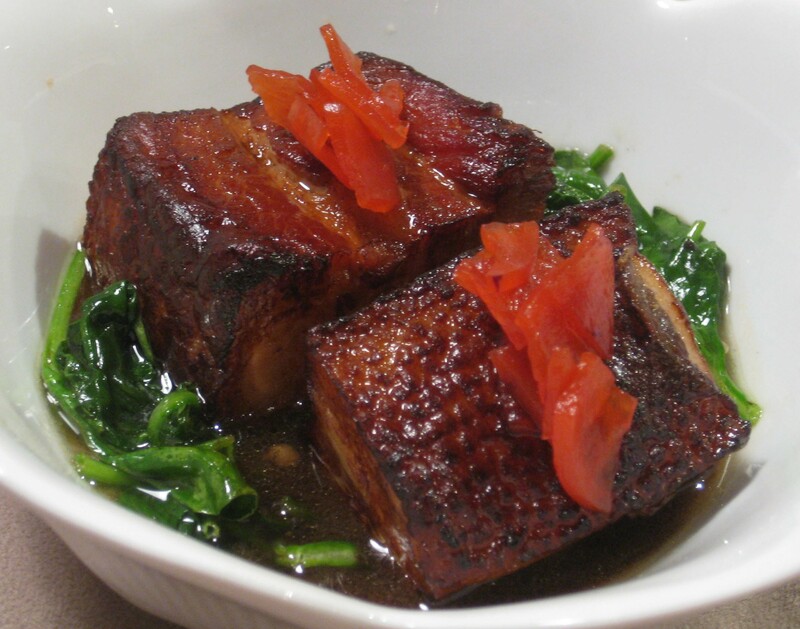 Below is the basic recipe for pork belly and serving suggestions for buta kakuni. Click the recipe tab on the blog for the ramen and bánh mì recipes. When I make this I usually serve buta kakuni for dinner that night, then use the remaining belly for ramen and bánh mì later on in the week. While the braising liquid is coming to a simmer, season the pork belly with salt and white pepper. Sear all sides in a hot pan. Once all sides are browned, place the pork belly in a deep baking dish. Pour the braising liquid on top. Cover and braise in a 325° oven for 2½ hours or until the pork is tender. Remove from the oven. For buta kakuni serve the pork on top of a bed of unseasoned sautéed spinach, and finish the dish by straining some of the braising liquid over everything. Served with steamed rice, pickles and spicy Japanese mustard (karashi). Cool the remaining pork belly in the braising liquid. Then place it into the refrigerator. To reheat simply slice the belly as desired, and heat the pieces gently in some of the leftover braising liquid. Gosh, I’m hungry again! I’m going to make sure one of our ‘in house’ cooks sees this asap. Keep up the good work! I’m so glad you loved the results! Smart move with the added broth… you have obviously mastered the art of braising. Did you eat all the pork belly last night or are planning to make other dishes with it?